There was only one singer who influenced me. I tried to sing like her all the time because everything she did made sense musically, and that singer was Connie Boswell. 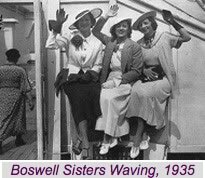 February 12, 1936 – The Boswell Sisters make their final recording together. The Irving Berlin lyrics seem prophetic. The first number features Connee, who hereafter will be on her own, carrying the lead in “Let Yourself Go.” On the second number the Sisters harmonize throughout the song, a fitting way to declare their new lives with “I’m Putting All My Eggs in One Basket.” Vet is pregnant at the time of the recording. Connee will appear sporadically on television, continue making nightclub appearances and will record two more singles for the independent Charles label. Those two sides (“I Don’t Mind/You Ain’t Got Nothin’) are very different from anything she’s recorded before and sound very much like the rockabilly music that was so popular at the time. These rare sides are issued on a “for DJ only” 45RPM’s but are not successful. Connee is on the board of an organization called, “Comeback, Inc,” whose focus is rehabilitation of the chronically ill, aged and handicapped. 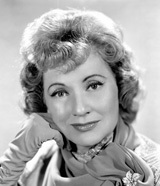 Music styles have been changing since the mid-1950’s and while Connee has experienced some success in television and with her albums of the past few years, these are fewer and further between now. This is complicated further by her husband/manager Harry experiencing the first of several heart attacks in the mid-1960’s. She decided to limit her performances to some occasional television work and club dates and stays much closer to home to care for Harry. 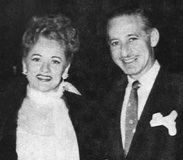 In radio interviews (and perhaps on television interviews as well), there was some talk about making a comeback, recording an album of Broadway tunes, and even that she had been working on her autobiography. There was also rumor of her talking with Hollywood studios about making a bio-pic of her life story, but these plans never materialized. She continues in her humanitarian work and volunteer appearances at children’s hospitals, and in her hobby of training dogs. After nearly forty years of marriage, Harry Leedy dies in New York City. Connee later said that he came to bed, kissed her goodnight and the next morning when she woke up, he was gone. 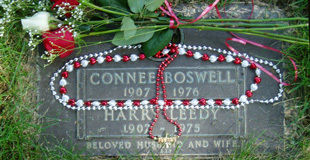 Connee makes more frequent appearances in clubs and even appears on a television program (August 16, 1975) with her old friend Bing Crosby. However, before long, it is clear to all that Connee is also ill. She has always had a very healthy appetite, saying herself that she could “eat like a horse.” She experiences stomach pain and she seeks medical attention. Connee undergoes surgery at Mount Sinai Hospital in NYC to remove a tumor from her stomach. Doctors are optimistic that they can remove the tumor successfully. Sometime afterward, they discover that the cancer has returned and begin chemotherapy. By the early fall, she is confined to her hospital room at Mt Sinai and finally asks doctors to stop all treatments. “My days are numbered and it’s just as well. Just how soon no one can tell. A face filled with frowns instead of a smile.